"Crab and egg go very well together in this delightful dish. Fresh crab meat is best but if you can't find it, use canned." Heat olive oil in a skillet over medium heat. Fry the potato in the hot oil until fork-tender, 5 to 7 minutes. Transfer the potatoes to a plate lined with paper towels and set aside. Return the skillet to medium heat. Cook the onion and garlic in the remaining oil until tender, about 5 minutes. Add the crab to the skillet and season with salt and pepper; stir. Cover the skillet and cook for 2 minutes. Stir the tomatoes into the mixture and cook another 2 minutes. Add the raisins, peas, and red bell pepper to the mixture; stir and cook another 2 minutes. Pour the eggs over the mixture. Cook until he eggs set, 2 to 3 minutes. 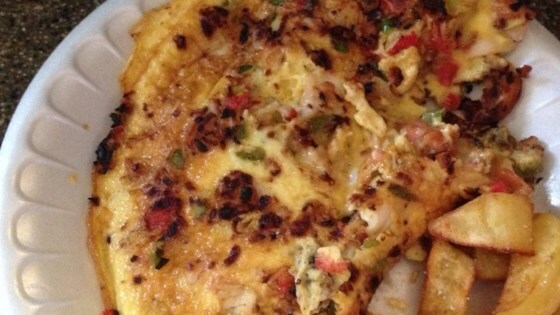 Flip the omelet and cook 1 minute more. Transfer to a serving plate and serve hot. Parmelet, short for parmesan omelet, is Chef John's latest breakfast craze.